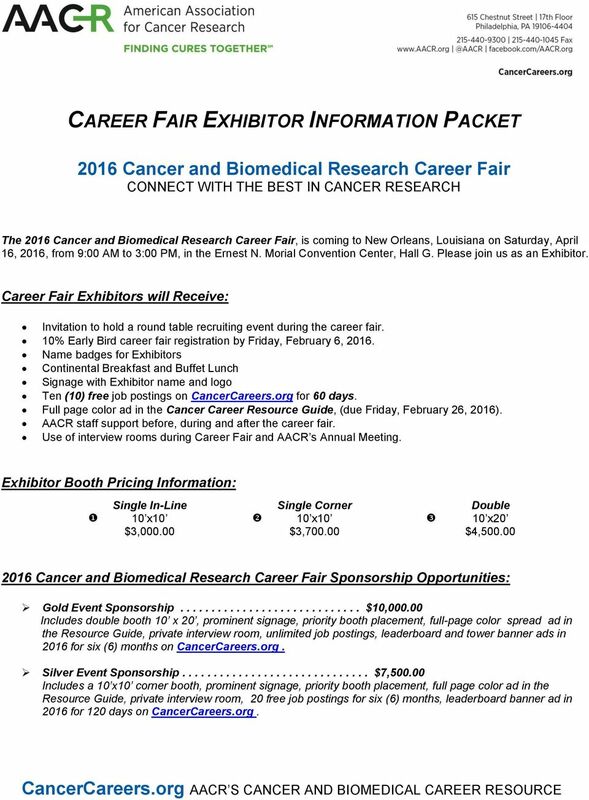 Download "CAREER FAIR EXHIBITOR INFORMATION PACKET"
1 CAREER FAIR EXHIBITOR INFORMATION PACKET 2016 Cancer and Biomedical Research Career Fair The 2016 Cancer and Biomedical Research Career Fair, is coming to New Orleans, Louisiana on Saturday, April 16, 2016, from 9:00 AM to 3:00 PM, in the Ernest N. Morial Convention Center, Hall G. Please join us as an Exhibitor. Career Fair Exhibitors will Receive: Invitation to hold a round table recruiting event during the career fair. 10% Early Bird career fair registration by Friday, February 6, Name badges for Exhibitors Continental Breakfast and Buffet Lunch Signage with Exhibitor name and logo Ten (10) free job postings on CancerCareers.org for 60 days. 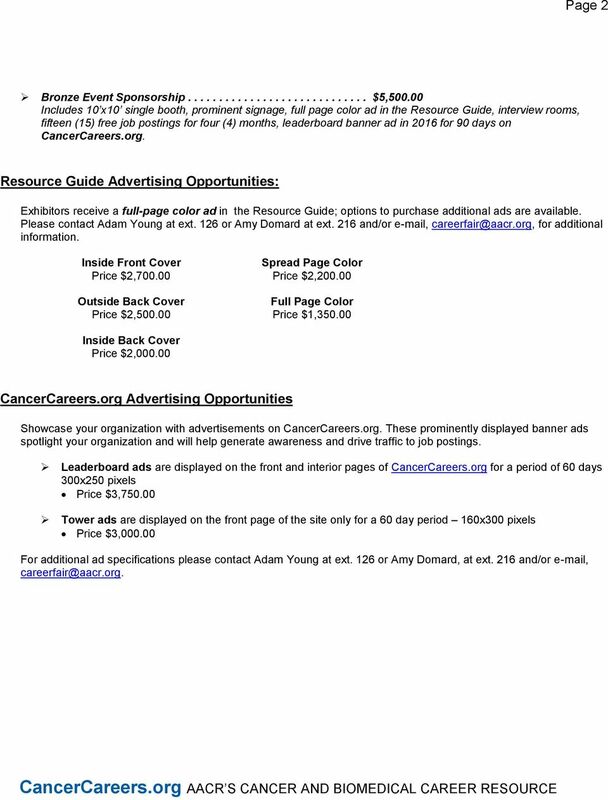 Full page color ad in the Cancer Career Resource Guide, (due Friday, February 26, 2016). AACR staff support before, during and after the career fair. Use of interview rooms during Career Fair and AACR s Annual Meeting. Exhibitor Booth Pricing Information: Single In-Line 10 x10 $3, Single Corner 10 x10 $3, Double 10 x20 $4, Cancer and Biomedical Research Career Fair Sponsorship Opportunities: Gold Event Sponsorship $10, Includes double booth 10 x 20, prominent signage, priority booth placement, full-page color spread ad in the Resource Guide, private interview room, unlimited job postings, leaderboard and tower banner ads in 2016 for six (6) months on CancerCareers.org. Silver Event Sponsorship $7, Includes a 10 x10 corner booth, prominent signage, priority booth placement, full page color ad in the Resource Guide, private interview room, 20 free job postings for six (6) months, leaderboard banner ad in 2016 for 120 days on CancerCareers.org. 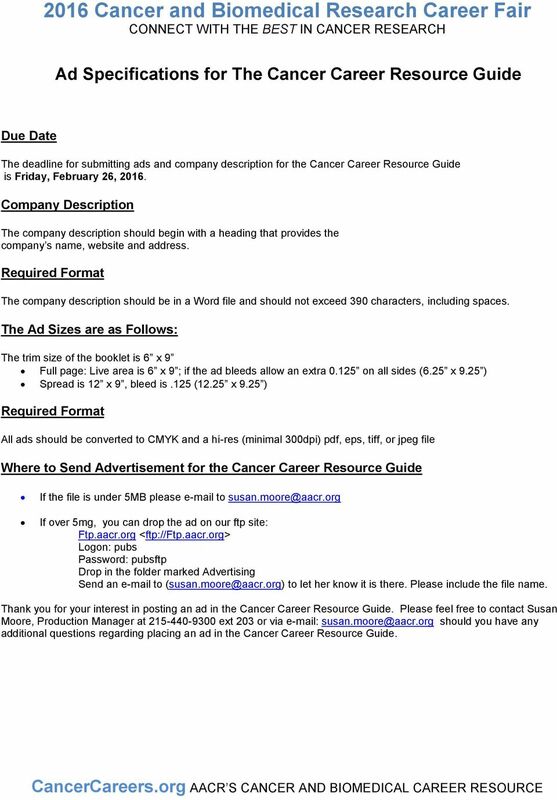 4 Ad Specifications for The Cancer Career Resource Guide Due Date The deadline for submitting ads and company description for the Cancer Career Resource Guide is Friday, February 26, Company Description The company description should begin with a heading that provides the company s name, website and address. Required Format The company description should be in a Word file and should not exceed 390 characters, including spaces. The Ad Sizes are as Follows: The trim size of the booklet is 6 x 9 Full page: Live area is 6 x 9 ; if the ad bleeds allow an extra on all sides (6.25 x 9.25 ) Spread is 12 x 9, bleed is.125 (12.25 x 9.25 ) Required Format All ads should be converted to CMYK and a hi-res (minimal 300dpi) pdf, eps, tiff, or jpeg file Where to Send Advertisement for the Cancer Career Resource Guide If the file is under 5MB please to If over 5mg, you can drop the ad on our ftp site: Ftp.aacr.org <ftp://ftp.aacr.org> Logon: pubs Password: pubsftp Drop in the folder marked Advertising Send an to to let her know it is there. Please include the file name. Thank you for your interest in posting an ad in the Cancer Career Resource Guide. Please feel free to contact Susan Moore, Production Manager at ext 203 or via should you have any additional questions regarding placing an ad in the Cancer Career Resource Guide. 5 Exhibitor Agreement 1. The Exhibitor of AACR s 2016 Cancer and Biomedical Research Career Fair agrees to rent the total number of booths set forth on the Registration Form. As a 2016 Career Fair Exhibitor, you shall not assign or sublet such space without the prior written consent of the American Association for Cancer Research (AACR). 2. The 2016 Cancer and Biomedical Research Career Fair will be held on Saturday, April 16, 2016, from 9:00 AM 3:00 PM, at the Ernest N. Morial Convention Center in Hall G, in New Orleans, Louisiana booth spaces are in units of 10 x10 single, 10 x10 corner, or 20 x10 double unless otherwise noted. Exhibitors booth space(s) will receive a 6 draped table, chairs, waste paper basket, and a sign indicating the Exhibitor s name. All booth space(s) include a 36 side rails and an 8 backwall, unless Exhibitor informs ACCR to the contrary. Upon request, AACR shall provide Exhibitor with additional materials as requested. Exhibitor s displays shall not block air or light flow, shall not be over 8 in height and shall not have display sidewalls extending more than 4 from the back of the booth (to a maximum height of 36 ), unless prior written approval is received from AACR. Exhibitor acknowledges that, pursuant to the theme of the exhibition, it shall use the booth space only for the purpose of recruiting, and therefore shall only display the products or services provided by their company/institution that are consistent with the theme of the Career Fair. All displays must remain within the booth perimeters and not intrude upon the aisles. Booths, table top displays, quick screens, branded tablecloths, easel displays and hanging banners are permitted and must fit within the parameters of the booth space selected. 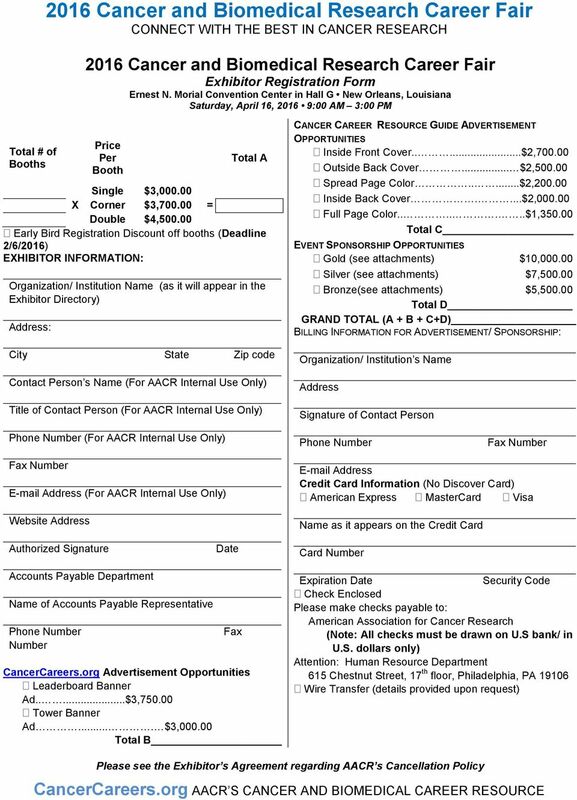 Although AACR shall use its best efforts to offer Exhibitors the location(s) requested, AACR reserves the right to alter the layout and booth arrangements that may differ from the illustrated floor plans previously announced, and further reserves the right to re-assign Exhibitor s booth locations. 3. Payment for the booth space must be made with the registration form. All amounts paid to AACR are nonrefundable and shall be retained by AACR. AACR agrees to accept that amount as liquidated damages. Exhibitor specifically agrees that it is legally obligated to remit to AACR any unpaid balance for the booth space(s) after retention by AACR of any amounts paid. In the event of cancellations, AACR shall have the right to rent the booth space to another party. However, any rental fees received by such rental shall not accrue to the Exhibitor s benefit or reduce its ability hereunder. The Exhibitor agrees that the amount retained by AACR is a fair and reasonable estimate of the damages AACR will suffer as a result of Exhibitor s cancellation. AACR is not responsible for damage to personal items brought to any career reception, whether by fire, theft, accident or any other cause. 5. Exhibitor shall set up its booth at the designated set-up time (and under no circumstances not later than two (2) hours prior to the opening of the Career Fair), shall adequately staff its booth during all Career Fair hours, and shall not disassemble or close its booth until after the Career Fair has closed to the public on the last day of the exhibition. In the case that Exhibitor s display or materials fail to arrive in time for the Career Fair, Exhibitor remains responsible for the payment of the booth space, or other fees payable. 6. 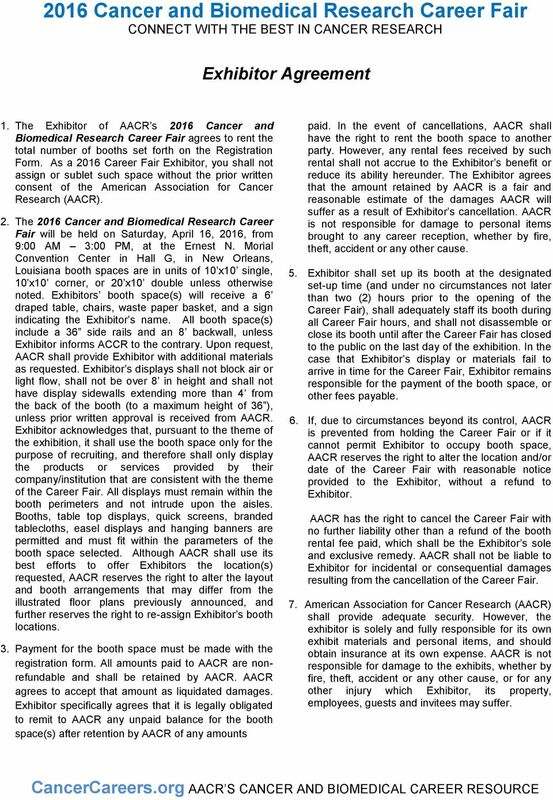 If, due to circumstances beyond its control, AACR is prevented from holding the Career Fair or if it cannot permit Exhibitor to occupy booth space, AACR reserves the right to alter the location and/or date of the Career Fair with reasonable notice provided to the Exhibitor, without a refund to Exhibitor. AACR has the right to cancel the Career Fair with no further liability other than a refund of the booth rental fee paid, which shall be the Exhibitor s sole and exclusive remedy. AACR shall not be liable to Exhibitor for incidental or consequential damages resulting from the cancellation of the Career Fair. 7. American Association for Cancer Research (AACR) shall provide adequate security. However, the exhibitor is solely and fully responsible for its own exhibit materials and personal items, and should obtain insurance at its own expense. AACR is not responsible for damage to the exhibits, whether by fire, theft, accident or any other cause, or for any other injury which Exhibitor, its property, employees, guests and invitees may suffer. 6 Exhibitor Agreement Page 2 8. 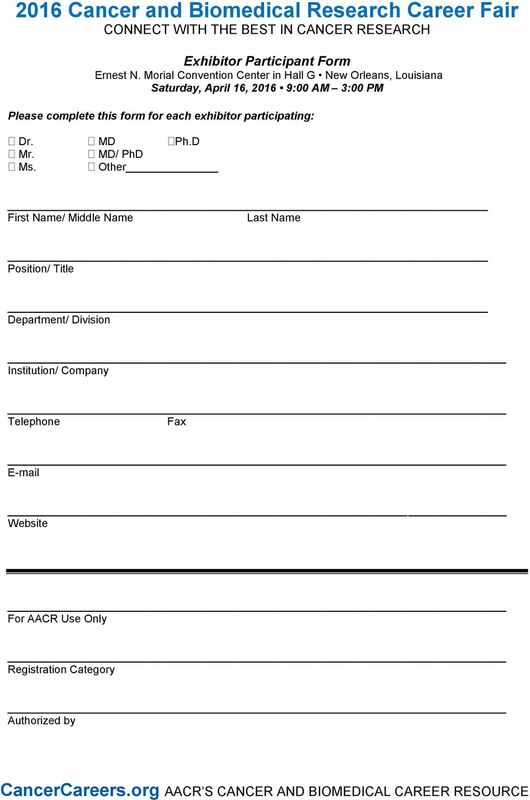 Exhibitor grants permission to AACR to use Exhibitor s name and/or logos for promotional purposes in connection with the Career Fair produced by AACR. This permission shall extend to photographs of Exhibitor s Booth. AACR shall promote the Career Fair in such manner and through such media at its sole discretion and may alter the nature, content and manner of its promotion to meet the needs of a particular market or of the location in which the exhibition takes place. 9. Exhibitor agrees to comply with the reasonable requests of AACR, their sponsors, agents and employees. Exhibitor further agrees that it shall observe the general rules and regulations of the exhibit hall at which the Career Fair is held. 10. Exhibitor assumes full responsibility for the actions of its agents, employees or independent contractor, whether acting within or without the scope of their authority, and agrees to indemnify and hold AACR and the exhibit hall harmless from and against responsibility or liability resulting directly or indirectly, or jointly, from the acts or omissions of its agents, employees or independent contractors, whether acting within or without the scope of their authority. 11. This EXHIBIT Agreement, when accepted by AACR, constitutes the entire agreement between the parties, supersedes all prior negotiations, representations and understandings, and may be modified only pursuant to its terms or by written notice signed by both parties. Pennsylvania law shall be applied to interpret this Agreement and the rights of the parties hereunder. In the event that a party brings an action to enforce its right hereunder or to seek a declaration of its rights or to obtain an interpretation of this Agreement, the prevailing party shall be entitled to reasonable attorney s fees in addition to all other relief. In the event that a court finds any provision of this Agreement to be unenforceable, all remaining provisions hereof shall remain in full force and effect. 12. 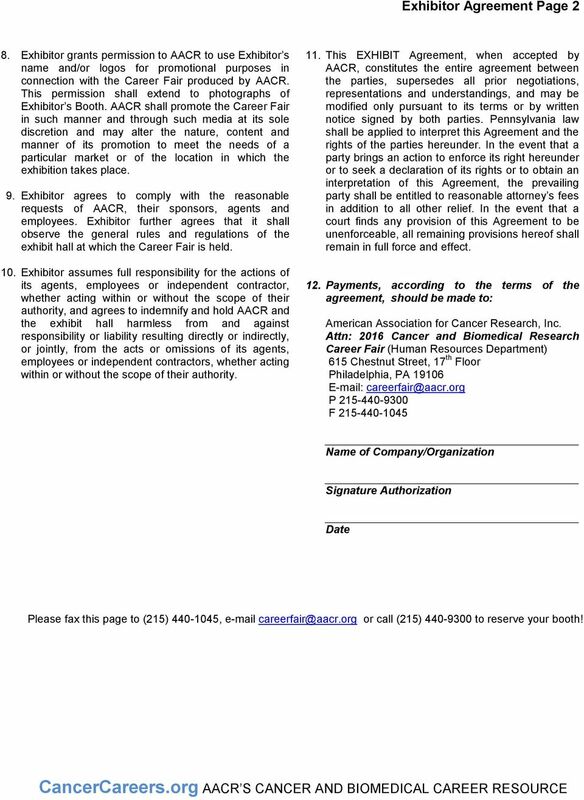 Payments, according to the terms of the agreement, should be made to: American Association for Cancer Research, Inc. Attn: 2016 Cancer and Biomedical Research Career Fair (Human Resources Department) 615 Chestnut Street, 17 th Floor Philadelphia, PA P F Name of Company/Organization Signature Authorization Date Please fax this page to (215) , or call (215) to reserve your booth! M.U.D. Group Sponsorships. Vendor Expo! Battery Power 2016. August 3-4 Hyatt Regency Tech Center Denver, CO. This year we will celebrate the Governor s Conference on Housing and Economic Development in Atlantic City on September 20 and 21, 2011. We expect 300 to 700 in attendance, which includes parents, teachers, doctors and other professionals. Indiana Township Association, Inc. 2016 Educational Conference SHERATON INDIANAPOLIS HOTEL & SUITES 8787 Keystone Crossing, Indianapolis, IN 46240 September 18-21, 2016 Indiana Township Association, Inc.
CORPORATE PARTNER PROSPECTUS. Connecting Members. Building Careers.